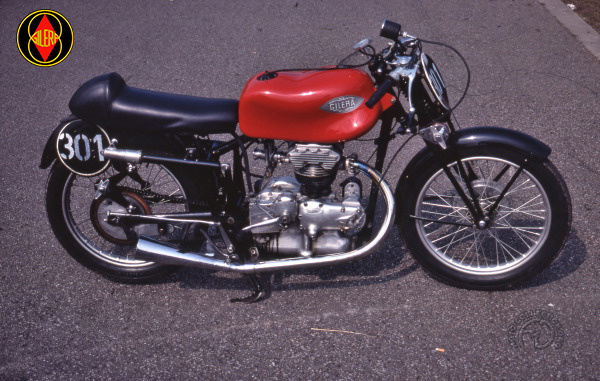 Gilera is so well known in competition history for its 500cc four and its Satumo 500 that its achievements in smaller-capacity classes are sometimes overlooked. These, however, were numerous, not least with this rare "client-competition" version of the Nettuno. Introduced in 1946, the Nettuno was an exact scale replica of the renowned 500 Saturno, which had been created in 1937. It had the same design of unit-construction overheadvalve engine, foot-change gearbox and the famous rear suspension introduced by Gilera in 1934. This was an original and efficient system where the swinging fork had vertical levers at the forward end to give an L-shaped profile. The levers had upper links that pulled against horizontal springs beneath the saddle. Classic Rudge-Whitworth friction dampers formed the fourth side of the rectangle. The overall layout was typical of the Italian school, always a step ahead of the British preference for separate gearboxes and Germany's attachment to rigid rear ends, which would remain the case until well after the war. Some 3700 Nettunos were built between 1946 and 1954. Up to 1952, the Nettuno was available in Turismo and Sport versions, the main difference being their cylinder heads - the Sport had a light alloy head - and the respective top speeds of 62 and 78 mph; the rare competition version could reach 87 mph. This exceptionally rare client-competition Nettuno has been fitted with a more modern tank and dual saddle during its long racing career.